Read the latest MCJ news on the Arts and Humanities blog here. CineCulture is a film series offered as a three-unit academic course in the Media, Communications and Journalism Department. CineCulture provides a service to the Fresno State campus students, faculty and staff, and community. Everyone is welcome to attend. CineCulture is also a campus club. The CineCulture Club promotes cultural awareness through film and post-screening discussions. **The Feb. 22 and April 26 films will begin at 5 p.m.** All films screened on campus are free and open to the public. Sighted Eyes/Feeling Heart is the first-ever feature documentary about Lorraine Hansberry, the visionary author of the groundbreaking play A Raisin in the Sun. An overnight sensation, this play transformed the American theater and has long been considered a classic, yet the remarkable story of the playwright faded from view. With this documentary, filmmaker Tracy Heather Strain resurrects the Lorraine Hansberry we have forgotten—a passionate artist, committed activist and sought-after public intellectual who waged an outspoken and defiant battle against injustice in 20th-century America. The film reveals Hansberry's prescient works tackling race, human rights, women's equality and sexuality that anticipated social and political movements on the horizon. Lorraine Hansberry lived much of her 34 years guided by a deep sense of responsibility to others, proclaiming: "One cannot live with sighted eyes and feeling heart and not know or react to the miseries which afflict this world." 118 minutes. The Santiago River, known locally as "the River of Death," flows along the outskirts of Guadalajara, Mexico. For 40 years, waste from one of Mexico's largest manufacturing corridors has been dumped into the Santiago. Eighty percent of the companies in the corridor – such as IBM, HP, Coca-Cola, Levi's, Honda and Nestlé – are American and Japanese. Therefore. this river has become a sewer with over 1,000 known chemicals, including dangerously high levels of arsenic, chrome, and lead. Silent River by Jason Jaacks follows a young woman and her family as they defy death threats to try and save the one of the most polluted rivers in Mexico. Over the last three years we witnessed some of the strangest conditions ever seen off the West Coast of the United States. What happens next? Was this just a weird few years, an anomaly in the normal flux of ocean conditions? Or was this a shift that we will look back on, decades from now, and point to as the beginning of a different era? Join an oceanographer and a paleo-climatologist from the Bodega Marine Laboratory on the Northern California coast to ponder what's next for the world's largest ocean. Directed by Costa Rican filmmaker Hilda Hidalgo Xirinachs, Violeta Al Fin tells the story of Violeta, a 72 year-old woman, who lives alone in her childhood home in the heart of San Jose, Costa Rica, after divorcing her husband of more than 40 years. She tends to her lush tropical garden and makes plans to turn her property into a boarding house. When she discovers the bank is about to take away her house, she decides to fight and breaks all the rules to hold onto her home and her freedom. In Spanish with English subtitles. 85 minutes. The real-life story of one working wife and mother who became a hero to hundreds during World War II. In 1939 Poland, Antonina Żabińska (portrayed by two-time Academy Award nominee Jessica Chastain) and her husband, Dr. Jan Żabiński (Johan Heldenbergh, a European Film Award nominee for the Academy Award-nominated The Broken Circle Breakdown), have the Warsaw Zoo flourishing under his stewardship and her care. When their country is invaded by the Germans, Jan and Antonina are stunned and forced to report to the Reich's newly appointed chief zoologist, Lutz Heck (Golden Globe Award nominee Daniel Brühl of Captain America: Civil War). To fight back on their own terms, the Żabińskis covertly begin working with the Resistance and put into action plans to save lives out of what has become the Warsaw Ghetto, with Antonina putting herself and even her children at great risk. 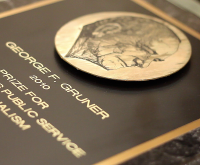 The McClatchy Company established the Gruner awards in 1989. The Department of Media, Communications and Journalism administers the competition and co-hosts the awards banquet with The Fresno Bee, which provides a grant to make the awards possible. The banquet took place March 6, 2019, in the Fresno Art Museum. The MCJ department coordinates the awards, including the call for submissions and the judging. The 2017 MCJ Alumni & Friends Hall of Fame Induction Ceremony was held on Thursday, Nov. 9, 2017, Hall of Fame Inductees are available on our website. The 2019 MCJ Alumni & Friends Hall of Fame will be held in November, 2019. Visit the Alumni Link to view our MCJ Hall of Fame Inductees. Kappa Tau Alpha is the only journalism/mass communication society recognized by the Association of College Honor Societies. KTA is the seventh oldest national honor society and was founded at the University of Missouri in 1910. There are over 93 KTA chapters in colleges and universities throughout the country, including the Dayle Molen chapter at California State University, Fresno. Membership must be earned by excellence in academic work. Only those students who rank in the top 10 percent of their classes are considered for membership. During some semesters the department hosts MCJ Day. MCJ Day is designed to celebrate the Department's five options and connect current students with alumni. Guest speakers and panelists provide professional development, and networking opportunities are available. Periodically the MCJ Department will host Roger Tatarian Journalism Symposia. These events bring in top-notch national and international journalists to share with the campus and broader community about important issues of the day. The Roger Tatarian Journalism Chair coordinates the symposia. This year's symposium was "Putting Fake News in the Rear View Mirror: How the media can win back the trust of all Americans." It featured speakers from ProPublica, the Washington Post, the Los Angeles Times and the Associated Press. It was held Tuesday, Feb. 26, 2019, in the Satellite Student Union. Former MCJ professor Dr. Gary Rice started the War Veterans’ Oral History Project in 2009-2010 and is the director of the project. The project gives veterans an opportunity to preserve their stories in their own words while students learn history from the people who made it. In the fall 2010 semester, students conducted more than 80 interviews. This was the second semester for the project. The new interviews were added to the first group, already cataloged and available to scholars, researchers and the public in the library's Special Collections Research Center. Interviews with more than 50 veterans of conflicts from World War II through Iraq and Afghanistan were presented on Dec. 9, 2010 to the Henry Madden Library at California State University, Fresno as part of the Central California War Veterans’ Oral History Project. The veterans and the 28 mass communication and journalism students of Dr. Gary Rice's class who interviewed them were honored at a reception in the Table Mountain Rancheria Reading Room of the library. At the ceremony, Charlie Waters, state judge advocate of the American Legion, praised the project for bringing together veterans and students. The oral histories — transcripts and audio recordings that meet accepted historical standards and guidelines — will be kept permanently in a special collection at the library. Bulge and a bomber crew member, who was one of the first Americans to fly against a German-built jet during World War II. Other interviews are with former prisoners of war; participants in Korean War events like the Battle of Heartbreak Ridge and the POW riots at Koje-do; a Vietnam War bugler and soldiers involved in fierce fighting during the Tet Offensive; and several recent veterans of the Iraq and Afghanistan conflicts. “Every veteran has a story to tell, and our students are doing their part to ensure the stories get told,” Rice said. The Department of Mass Communication & Journalism hosted its 16th Annual Scholarship Reception during the 2018-2019 school year. For more information the reception or scholarships, contact Prof. Betsy Hays, MCJ Scholarship Chair, at bhays@csufresno.edu.